Before reading further, you may like to note that from our experience, the actual cycling is probably going to be the easiest part of your fund raising activities! Although we use “cycling” as our main activity, most of what follows can be applied to any activity – running, climb a mountain, a long walk, stair climb, etc. First, here is an easy one for you and your family! Set up a “Loonie Bin” (for our non-Canadian friends, a “Loonie” is what we call our 1 Dollar coin!) Each day when you arrive home, get everyone to drop their spare designated coin into this jar! Need not be as much as a dollar – could be quarters, dimes, etc. You will be quite surprised at how much accumulates over a year! 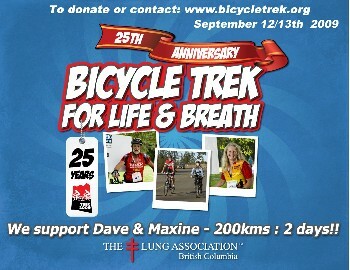 If you are embarking on a fund-raising event (such as the BC Lung Trek) for the first time, your best source of funding will be family and friends, most of whom may be persuaded to part with a few dollars. Hopefully, you can collect a reasonable total by way of many smaller donations. The problem with this approach is that you cannot keep hitting on the same friends and relatives year after year! If your event is one time only for you, then there is no reason not to also use all that follows! Have you thought about all those boxes in the garage/attic/storage laying unopened for months/years? Do you really need all that stuff? It is quite surprising what people will purchase on sites such as eBay, or more locally you can try Kijiji Canada, or within the US Kijiji USA, or even more locally, the city specific sites such as Used Vancouver, or if not Vancouver, try typing into your web browser “www.usedyourcity.com” replacing “vancouver” with your city name. Kijiji and UsedVancouver tend to be cheaper than eBay, or even free, so if you have doubt about the selling potential, try those sites first. Depending on your culinary skills, organize either a garden tea party, BBQ or dinner and invite friends in return for a fixed donation. This involves a cost to you, which could be offset by some form of “bring a plate” request. Could even host a “pot luck” dinner or lunch, but the more effort your invited friends have to contribute, possibly smaller will be their donation. Depending on the nature of your friends, there is a variation of the 50-50 draw. You provide the full meal, figure its cost, then treble that cost as the entry ticket and make draw such that the winner receives 30%, you get 30% for the meal costs, and your charity gets 40%. With wealthier friends you could increase the initial ticket cost with all the extra added to the charity’s portion. If you are lucky enough to be able to get some free time (Dave is retired!) 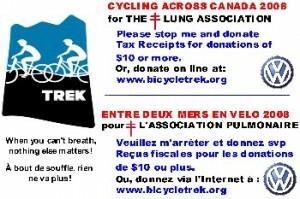 we made over $1,000 for the Lung Association in 7 days by delivering Yellow Pages! It is difficult to deliver over a weekend as many commercial addresses are closed, so if you deliver residential on a weekend, there is a risk of repeating some of the route on a weekday to complete any commercial deliveries. Not necessarily a big problem as there are not too many commercial premises in residential areas. You get to see the available routes, and can choose what you think may be best for you. But it is on a “first come, first served” basis, and we found that many local charities already had a “block booking” on some of the easiest routes! Some delivery info is that apartments are delivered door to door within the buildings, unless a representative from the building would prefer otherwise. In rural areas the books to go to the door which often means using long driveways – unless gated closed. In that case drop at a place where the homeowner would normally receive deliveries. Payment can change by area and time of year, but population is usually the determining factor. Hence normally density would determine the pay rate. In big cities the rates would seem lower, down to about 20 cents per stop, whereas in rural areas the rate could be up to .33 cents per stop. Differing densities would be reflected in rates between these two figures. Be sure to pick one route worth enough to cover your fuel costs, and have the payment made out to you for this one, and direct to your charity for the others. This avoids a tax problem! We have developed some useful delivery methods to maximize efficiency, and would be happy to share – see the email tag below. So, when you feel that family and friends have had enough of you, where next? Well, at this point, fund-raising separates into two distinct approaches depending whether you plan to fund raise locally, or maybe you plan something bigger such as provincial or even national. First, let’s look at fund raising locally. After family and friends, it is time to tap into the wider circle and write or telephone people you work with, your social circle, organizations you belong to (think church, service clubs, sports clubs, etc. ), old college friends, teachers, and maybe distant relatives you forgot when first contacting family. Don’t forget your dentist and/or physiotherapist. Sit down and make a list of the people you know. Then go through the list and ask yourself “how do I know this person and who else do I know from the same place”?? We suggest a personal appeal letter or phone call rather than email for this initial approach. Very important to follow-up a few weeks later with some sort of report on your success to date – email is acceptable as a follow-up, and is especially useful if you have an on-line donation facility. If you are employed, ask your employer for a donation! Both your employer and some of the other businesses you approach may prefer to donate product rather than cash. These can be raffled (careful about any local, or other laws, concerning raffles!) or if your charity holds any form of annual get-together, donated goods can be auctioned. Now, how about local business outlets? Next, turn your attention to smaller, local businesses. Here you can also try the local outlet of big corporations as they may have funds for simpler local events. Go along to the local radio and newspapers with a photo (or use the artwork for your flier – see ours below) and story about you, your past adventures, and the event you are planning – make it newsworthy, and just mention in passing the charity you are supporting. The aim here is to get known locally, not necessarily to get funding from the local media. Start off with visits to the enterprises you use regularly taking a copy of the local newspaper article about you, and tell them about your plans. Note that local outlets of big franchises will most likely have to refer to their main owner, or simply tell you to apply via their website. Shopping Malls are mostly filled with these local franchises, and to date, we have had no success with requests via their corporate websites! Therefore, it is better to concentrate on the street front stores usually locally owned. It is a good idea, but not essential, to have a website to show them, but be sure to carry an original letter from your charity – plus some copies in case they need to refer to their accountant. If you can get a big donation – $100 or more, then with their permission, put their logo and hyperlink onto your site. A word of caution about websites – their cost. Unless you can launch one yourself, or have a friend to do it and maintain it for free, you could end up paying out more than you collect! It is very important to emphasize you are not seeking personal sponsorship, but direct donations to your charity! We found that the word “sponsor” often led to a belief we were looking to cover our own costs, so be clear that all funds raised go direct to the charity. Official Tax Receipts from that charity are essential. Another, or additional, method of approach to a local outlet of a large franchise that sells smaller items in quantity, is to ask for a specific day when for each sale of one particular off-shelf item, the store will donate $1 An example could be a clothing outlet that could give a “Jeans Day” when for every pair of jeans sold on that day, they donate a dollar. Try your local restaurant – maybe get a dollar for every meal served on a particular day, and make sure all your friends eat there on that day! To support these events, you need to spend the day outside the store, with your bike and a poster giving the information. Make sure the store contacts the local media so they get some advertising in return! When we were supported by VW, we used this poster and got press, radio and TV coverage! We also left the same poster on our bikes whenever we stopped anywhere! Above is an example of our poster. Do you play golf? How about your local club running a one-day competition? You can approach your local stores to donate prizes. A “hole-in-one” grand prize is not out of reach – the donor has only to put up the cost of insurance and employees to monitor the particular hole throughout the day! Maybe expand to national business outlets? If your event is provincial, or national, in scale, you can still try all the local ideas above, and something like the “Jeans Day” could be pursued for each outlet along your route – but this would give you scheduling problems to plan your arrival on the correct day! We have to realize that big corporations exist to make money – they are not philanthropic societies. Their websites write about being “good corporate citizens” and having departments “dedicated to sponsorship” which is all very true, but they seem to dedicate all of their charity budgets to high exposure, big ticket events that provide maximum PR. So, unless you are fortunate enough to know somebody high on a corporate ladder, your chances of getting corporate funding for your ride are remote. We came up with a few good ideas to tempt the big guys, such as visiting their local outlets with our bikes and posters acknowledging their support, big slots on our website with links to their own sites, and in towns we visit that also have a sponsor’s outlet, use local radio to advertise our venture and hence air time for the sponsor. This has not yet worked on a national scale via any corporations’ head office. But, what did work was to select a target corporation and then make a direct approach to their local managers on, or near to our route. For our 2008 cross Canada ride, we developed a plan and then telephoned our target businesses in every city en route. Via their switchboards we obtained the name of the Manager, and then mailed a personal package “selling” our plan. This needs to be done early in the year before any charity budgets are committed elsewhere. Allow a few weeks to pass, and then follow-up with a phone call. Most businesses have a local advertising budget, and hence have local media connections, so it should not be difficult for them to arrange local coverage. Use this in your plan – a photo of you outside a showroom provides free advertising! 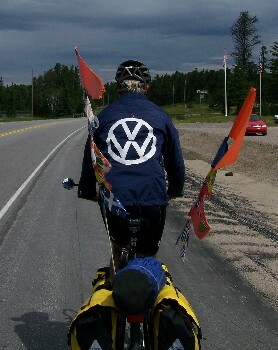 If you plan an event (run, cycle, etc) that takes place out in public, mention this and the exposure available if you wear some form of advertising – see my home artwork on the VW jacket which proved to be very noticeable to passing drivers. You may be lucky and get some free clothing already printed with the relevant logo! Don’t forget to emphasize that all the funds you raise go direct to the nominated charity. If your charity has an official website with secure on-line donation facilities, then donors will see that their funds don’t go to you. But also get official tax receipts from your charity – not everyone can donate on-line. People will be more inclined to give when they realize you are doing the whole thing at your own cost, and you are not trying to cover any of your own incidental expenses. When it is all over, don’t forget the “thank you” notes! A Xmas or New Year card mailed to all the business supporters reminding them of the charity and informing them of your total amount raised will be much appreciated! For family and friends use email to thank them. Good luck – and email us with any successful ideas of your own! !